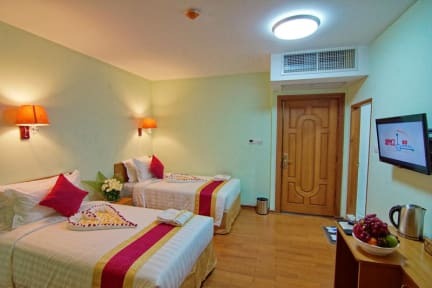 Hotel A1 is located at the down town area of Mandalay which is the second largest city of Myanmar and also economic hub which is connected with all the neighbor countries by land lane. 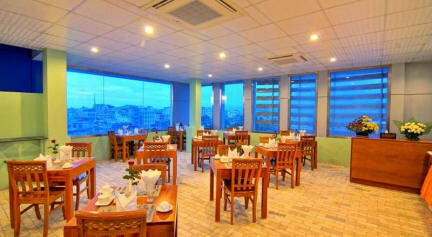 Our Hotel A1 is located at very nice environment which is convenient to travel to all the famous and attractive places of Mandalay. With stunning views of the Mandalay city, hotel A1 is the best hotel with top quality amenities and warm hospitality, ensuring a stay of luxury and comfort. 1) Check in:14:00 - 23:00. 3) We accept credit card and cash payment upon arrival. A really nice hotel with attentive staff and round-the-clock cleaning. The free breakfast is really good and everything about the room was perfect. From the bed to the aircon and shower, I loved it all. I would definitely stay here again in the future. Great hotel especially for the price. The front desk staff were outstanding and so helpful booking things, offering recommendations, and taking care of us. They made our stay in Mandalay very enjoyable. The breakfast is good too and the room was spacious and comfortable. Would definitely stay here again and highly recommend it to other travellers. Brilliant place, friendly helpful staff, good room, nice hot showers. Would 100% stay again. The staff at A1 is fabulous!!! They helped us book a taxi driver for the day to see all of our sites and the breakfast at the hotel was also superb! We recommend for a short stay! Amazing! The best hotel in Mandalay! The staff is very kind and helpful. The room was clean compared to the other hotels in the city. Although the could improve in the cleaning, meanly under the beds and in the bathroom. This was a real luxury for us in Mandalay. The room was enormous, spotlessly clean and the air con was really cold! the free breakfast was also fine and set us up for the day. It was the best value place we stayed in Myanmar. It's a bit out of the way, but there are free bikes you can use. There are also some great restaurants nearby. The room we stayed in smelled like Durian fruit. Otherwise room was ok. Breakfast was plentiful. Good facilities with room service. Clean and centrally located. A clean basic hotel that’s close to everything. Free bikes (riding on the road seems like chaos but everyone drives slow and courteously). Take a head torch to Myanmar if you’re gonna ride a bike - none of them have lights. Staff are really friendly and helpful - they booked our ferry to Bagan for us and the taxi to the jetty. WiFi works the same as everywhere else - fine for messaging and emails, don’t expect to video call or watch YouTube. Hot water in the bathroom. Totally recommend. Breakfast was good. The room was clean except that the electricity was down sometimes and caused the lift unavailable. The survice was super friendly with some hickups. Hotel A1 was an adequite place to stay. We were informed on check in that our twin room has been given away and they tried to get us to agree to sharing a double. We said we were disappointed that what be booked couldn't be given to us and that we felt uncomfortable sharing a bed. They ended up giving us our own seperate rooms for the night. I was disappointed when we rented a motorbike and it stopped working twice during the day. I felt they didn't care about our safety renting us that bike.